Are you looking at buying a Defibrillator for your Organisation? There are many on the market that are aimed at the non-medical environment such as manufacturing Businesses, Leisure Centres and Offices. It is a fact of Life that whilst certain types of people are more prone to having a Heart Attack or Cardiac Arrest, they can happen absolutely anywhere and at any time. Having a Defibrillator close by can literally make the difference between life and death. A Defibrillator for use within a Business costs about £1,000, which if you put into context of a life saved, is not that much really. Multiple Businesses or shops in the same building could share the cost of buying and maintaining one, reducing the cost further. Someone who has an out of hospital Cardiac Arrest has about a 10% Chance of survival. If defibrillation is delivered promptly, survival rates can be as high as 75%! There are several manufacturers of Defibrillators. They all are programmed to the same International Protocols and can all be updated should those protocols change. You do not need training to use a defibrillator – if you need one, just take it, switch it on and listen, but training does take away some of the mystique and worries about using a defibrillator. Once you have been trained on one, you will be able to use any other brand just as easily. On our training courses, we try and expose you to more than one type (we currently use three different manufacturers) so that you can see the differences and also note how similar they are. What does 4 Minutes recommend? 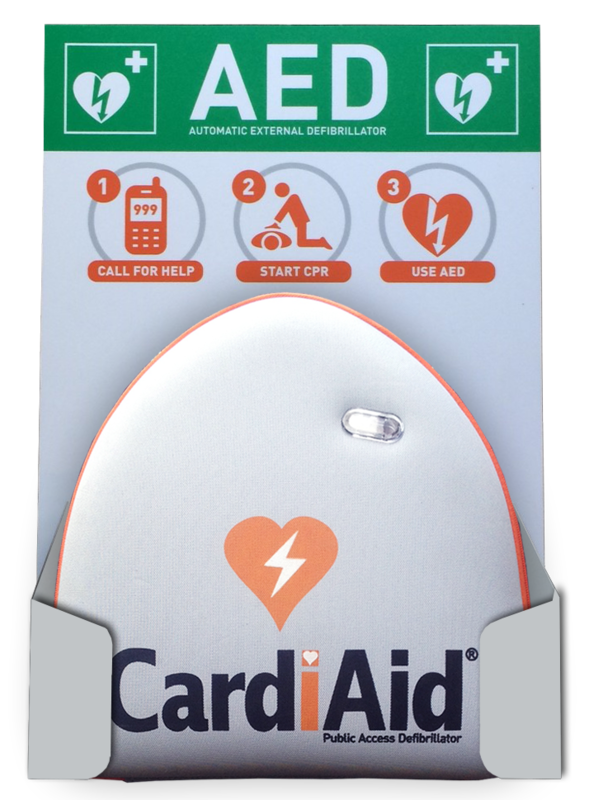 Although we can support you whatever brand of Defibrillator you choose, we recommend the Cardiaid AED (AED stands for Automated External Defibrillator – it just means that it does all the thinking for you, you just need to press the button). 2-year maintenance schedule, checking the unit and also changing the battery and pads, so it is always in-date and maintained. 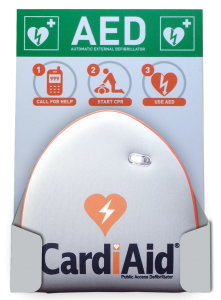 With its special design, CardiAid Wallmount ensures that CardiAid AED is noticeable and easily reachable in case of an emergency. 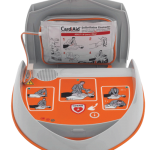 CardiAid Wallmount provides practical storage for the CardiAid AED. It also provides storage for spare electrodes, if necessary. and is especially suitable for places where there is no need to secure the AED. 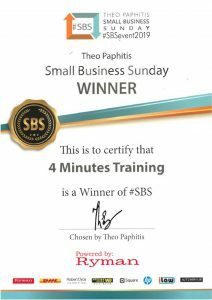 Does 4 Minutes provide training? 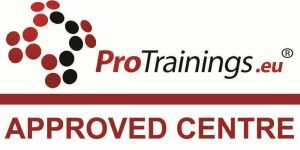 We can also provide you with a training package. 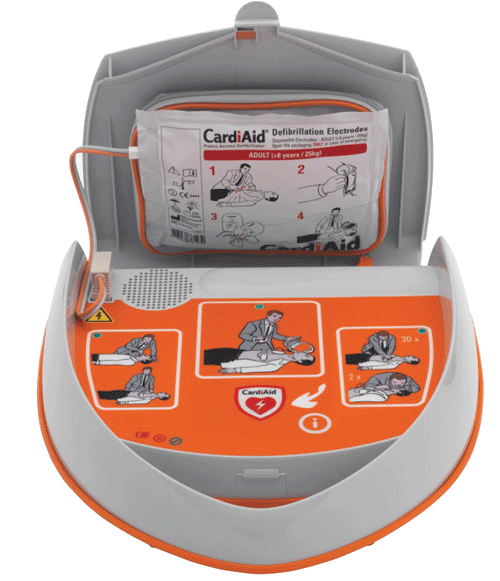 As we keep saying, you do not need to be trained to use one, but our courses will give you the confidence to use a Cardiaid Defibrillator – our training courses also demonstrate other brands so that you can have the confidence to use different types if you are away from your office and the Cardiaid Defibrillator. 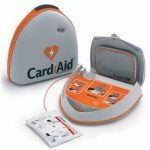 Cardiaid offers a fixed cost service contract which guarantees that your CardiAid AED is always in good working order. The contract will commence 24 months from date of purchase and each cycle lasts 24 months. Checking software. If necessary, the software is updated for compliance with the most recent ERC/NRR guidelines. Checking for any damage and irregularities. After servicing, the AED is provided with an AED hallmark sticker. In addition, we save the service report in your personal file. The service engineer will supply the service with a signed service sheet for your records. CardiAid will take a read out of the AED data and provide the patient’s ECG data to the attending cardiologist if requested. We ensure there is a functioning CardiAid available to you within 24 hours. We ensure the CardiAid is provided with a new main battery. We ensure the CardiAid is provided with a new set of electrodes. Call us today on 0330 223 2801 / 01628 56 99 22 or contact us through the contact form for a no-obligation chat.